FILTER FAQ NITTO KOGYO CO.,LTD. In this section, we will answer the basic question, so please utilize here for maintenance. Q:How often do I need to exchange an oil filter? We recommend you to change it when you exchange engine oil or every 6000Km (Apx.3728miles). If the car is new one, we recommend it to change by 3000Km (Apprpx. 1864miles). オイルだけ交換の場合　同時交換の場合　 Actually, used oil filter has old oil its inside, so you shouldn’t mix new and old oil. Q:Why do I need an oil filter? To take out dust or sludge from oil, and let clean oil go through an engine to work well. 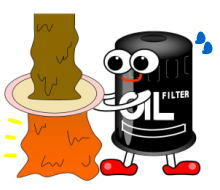 Q:How does an oil filter works? Oil will be filtered and go to an engine. If a filter is almost dead, the oil go through relieve valve and then go to the engine without filtering. This is invisible, so it is needed to be changed regularly. Why Air Filter needs to be exchanged regularly? Q:How often do I need to change an air filter? We recommend you to change it by every 10,000Km (Apprpx. 6214miles) or once a year. Q:How does an air filter work? There is dust on the air. The air filter catches the dust and sends clean air to the engine. Q:What is happen when the filter is clogged up? Clogged filter produce lower sending air to the engine. This causes lower engine power and high using fuel. The chart below shows how the air filter affects to engine power and fuel using.